President Moon Jae-in is expected to use his upcoming trip to Singapore and Papua New Guinea to upgrade relations with Southeast Asian nations and drum up international support for his peace drive with North Korea. Moon is set to leave for Singapore on Tuesday for a three-day visit to attend a trio of annual summits hosted by the Association of Southeast Asian Nations -- a Korea-ASEAN summit, an ASEAN plus three summit also involving China and Japan and the broader East Asia Summit. Moon plans to propose holding a special Korea-ASEAN summit next year to further solidify relations with the Southeast Asian nations under his "new southward policy." Moon also plans to host a separate summit between Korea and the Mekong River countries of Laos, Cambodia, Myanmar, Vietnam and Thailand. Presidential officials said the trip to the city-state is aimed at upgrading cooperative relations with ASEAN through expanding trade and people-to-people exchanges, strengthening regional crisis management capabilities and speeding up discussions on how to respond jointly to the fourth industrial revolution. 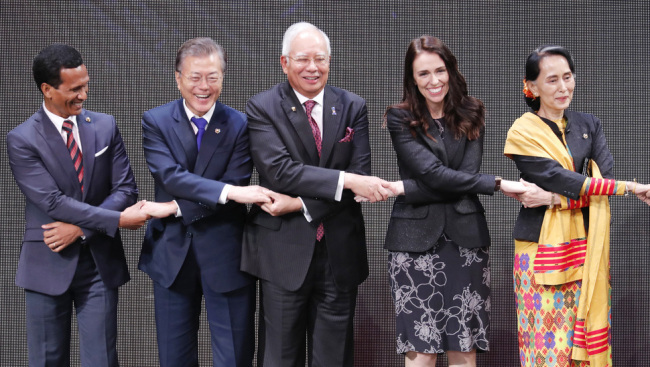 Moon will then visit Papua New Guinea on Saturday and Sunday for this year's summit of the Asia Pacific Economic Cooperation forum involving Pacific Rim nations. During the summit, Moon plans to outline his vision for an innovative and inclusive nation and propose creating a joint fund, the APEC Digital Innovation Fund, aimed at improving the region's digital capabilities, officials said.